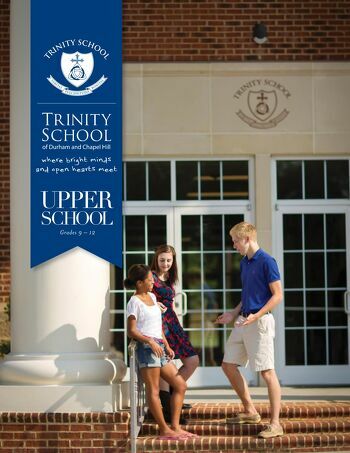 Trinity’s Upper School is a transformational place. Students come here to be challenged intellectually, to learn in a place that values honor and integrity, to work closely with a talented, student-centered faculty, to develop life-long friendships, and to make a difference. They work and play hard, inquire deeply, discover new gifts, pray together, and grow as servant-leaders. They certainly graduate ready for the college classroom. But they also leave with spiritual and theological moorings that, we pray, will guide and sustain them throughout life. Rich learning requires lots of time. It doesn’t happen quickly, and it needs to value understanding more than coverage. It occurs best when expectations are high and the school provides plenty of room for dialogue, reflection, discovery, connection-making, and meaning-constructing. This is where our sights are set in the Upper School, and we do so in the conviction as educators and Christians that full intellectual engagement for each of our students honors God and the amazing minds he has given them. Ours is a community of students and teachers who like being with each other, and the bonds run deep among students and between them and the faculty. Whether it’s hanging out in The HUB, competing in our Robotics program, helping others through our service-learning program, excelling in the arts, editing the yearbook or our literary arts journal Pickett Road, serving on Honor Council, showing up for our many student life events, or playing on our superbly coached teams, students here find a community with amazing opportunities to grow into their God-given potential.